When my husband Mark and I, newly wed in 1995, were building our two-story “dream home,” we carefully considered the design, even to the point of making doors wide enough for a person in a wheelchair in case one of our aging relatives had to temporarily live with us. We thought this would be our retirement home. Boy, were we wrong! On June 13, 1998, everything changed. While I was biking with Mark on that beautiful spring day, a three and half ton tree I was riding by suddenly collapsed on top of me, crushing my spine and leaving me paralyzed from the waist down. Living with a spinal cord injury, I discovered, comes with many obstacles—not least of which was getting into and around my own home in a manual wheelchair. A very steep wooden ramp had to be built just to get me inside my house. Doors had to be removed in the bathroom, laundry room and shower because they obstructed my wheelchair. The kitchen, where I was primary cook, had to be changed—dishes, glasses, pots, and pans moved to lower shelves, Lazy Susans placed in the pantry, and full extension drawers installed in the lower cabinets. It has been seven years since my injury and we have learned to live in our house with many adaptations (including a lift to replace the steep ramp). Presently, however, we are planning to build a home that would better accommodate both of us. I first became aware of universal design (UD) while reading a magazine piece about a home built on UD principles for a woman using a wheelchair. I saw hope for my future. A legacy of the earliest accessibility movement of the 1950s and the disability rights access-for-all movement of the 1970s, UD is a framework for making tools and spaces usable to the widest range of people in the widest range of situations without special or separate design. Our research on UD included trips to the library, Internet searches, speaking with others who used wheelchairs and a visit with Bev Rackett, our local independent living center director. We visited homes built by wheelchairs users. We took photographs and interviewed the homeowners. We took extensive notes on what features limited accessibility for the owners and which features worked well. Often, we found, homeowners were forced to settle for less than ideal. One two-story home we visited had no elevator, so the home owner, who used a wheelchair, did not have access to his basement or second floor. I found many instances where homeowners could not roll close enough to their bathroom and kitchen sinks for lack of knee space. One woman was unable to rinse her dishes and put them in the dishwasher because, at the sink, her wheelchair blocked the dishwasher door. What I have learned from the experience of seeing others’ homes and working with the UD professionals is that there are many home features that will allow people of all ages, sizes and various levels of abilities to live more fully in their homes. I developed a critical eye over time as I traveled from house to house and evaluated the various versions of my home floor plan. While looking for a suitable builder for our project, we discovered just how novel UD is in the world of residential construction. Of all the model homes we visited, not one was wheelchair accessible. As we looked at the ranch-style floor plans that each builder had to offer, we became discouraged because usually only one ranch-style floor plan was available and none of these met our needs. One building company, C.V. Perry in Columbus, Ohio, told us we could modify their existing floor plan by erasing all the interior walls and redrawing a new floor plan within the original house footprint. As Mark and I approached this task alone we quickly became overwhelmed and hired architect Patrick Manley. After a few months of trying to “shoe horn” our space needs into the builder’s existing footprint, we realized we were spinning our wheels. The only logical solution would be to create our own unique floor plan. Meanwhile, we continued to research. 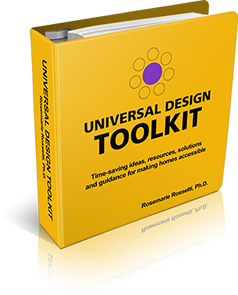 One book I read was Universal Kitchen and Bathroom Planning by Mary Jo Peterson. It occurred to me that we needed to involve Peterson herself in this project. I sent her an e-mail, and in January 2005, I finally met her in Orlando, Florida, where she was delivering a presentation on UD for the National Association of Home Builders (NAHB) International Builders’ Show. With Mark’s height of 6'4", and my seated height at 4’2”, we present a design dilemma for positioning countertops, mirrors, sinks, cooktop, and cabinets. In order to properly position these items, Peterson needed our height and reach measurements. She introduced us to the latest in hardware, cabinets, appliances, and technology that further improved accessibility. In Orlando, Mark and I evaluated products at the exhibition based on their accessibility, ease-of-use, independence-of-use, ease-of-maintenance, safety, energy efficiency, healthfulness, use of renewable resources, and decorator style. We also had our floor plan reviewed by architects and UD specialists. We attended several seminars on UD, immersing ourselves in the subject matter. When we returned home, Mark created a computer database of all the products we were considering for the home, which we shared with C.V. Perry employees, Manley, and Peterson. Our home is slated to begin construction this spring. Upon completion in late Fall 2006, it will serve as a national demonstration home and Universal Design Living Laboratory. The landscape will be wheelchair accessible and include raised beds and containers in the gardens. The home will showcase the latest products and technology supporting the principles, not only of UD, but also of green building (which optimizes use of natural resources including energy and water) and healthy home construction (which aims to increase the quality of air and water in the home). Rosemarie Rossetti, Ph.D. is a speaker and writer. To subscribe to her free monthly inspirational column, go to: www.RosemarieSpeaks.com. 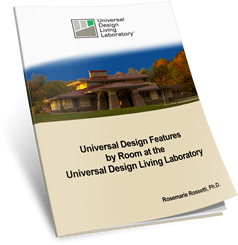 To learn more about the Universal Design Living Laboratory, go to: www.UDLL.com.